Shoulder Surgery Preparation - William Jay Bryan, M.D. The shoulder joint is exceptionally vulnerable to being injured and obtaining arthritis. According to the American Academy of Orthopedic Surgeons, in 2006 approximately 7.5 million people reported shoulder having pain. When the traditional treatments do not work, or nor longer work, shoulder surgery may ensure that you regain strength and movement. Talk to your doctor about what you should expect to experience before, during, and after the surgery. Ask what the process is for hospital admittance, the type of anesthesia you will receive, and how long you will be in the hospital. Also, ask about the recovery period and pain management following surgery. Now is when you need to voice your concerns. Being in the best physical condition you can be prior to surgery will lower the chance of complications and speed recovery. Your doctor will be able to tell you what this entails for you, such as issues with smoking, diet, weight, alcohol, and exercises to do before and after surgery. Notify your doctor if you come down with a fever, cold or any other illness in the week before the surgery. How long does the shoulder  replacement surgery take? Shoulder replacements take about 1 hour of surgery time. Total and reverse total shoulder replacement patients spend 1 night in the hospital. When can I use my shoulder? How long do I have to wear the sling? 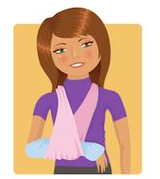 Following total shoulder and reverse total shoulder replacement your arm will be in a sling for comfort. You are allowed to remove your arm from the sling and move your arm and shoulder in basic motions. We are not operating on your elbow, wrist, hand, and fingers and you should move them to keep from getting stiff. You will be taught pendulum exercises to keep the shoulder supple and moving. You should not try to raise your elbow above your shoulder or put your operative arm behind your back but you may use your arm in front of you (much like “making a pizza”). You will be able to write, use a computer, brush your teeth, feed yourself but you will not be able to brush and wash your hair with the operative arm. You should NOT lift anything heavier than 2 pounds with your operative arm. Lifting restrictions will be removed as you progress through physical therapy. The sling is usually discontinued after 4-6 weeks. Upon leaving the hospital there will be a clear bandage over the wound. This bandage is waterproof and you may shower immediately. This bandage should be removed by you in 3-5 days after going home. After removal of the bandage the wound should be left open to the air and only covered when you shower. You may take a shower after bandage removal as long as you cover the surgical site with plastic. We recommend Glad brand “Press and Seal,” as it provides excellent waterproofing for showering. When do I return for my post-operative appointment? We prefer to see our total joint replacement patients about 2 weeks after surgery for their post-operative visit. The post-operative visit includes x-rays, wound assessment, and if necessary, staple removal. How much help am I going to need after surgery? Regardless of type of shoulder replacement, you will be up and walking immediately. You will be able to take care of basic activities by yourself. You will be much slower after surgery and you may need help with more complex tasks. We prefer that patients have someone at home all the time for the first few days after hospital discharge. Following the first few days, patients may be alone as long as they can reach others for assistance, if needed. Total shoulder replacement patients may drive as soon as 2-3 weeks. Everyone is different in their therapy protocol, but generally total and reverse shoulder replacement patients need 8-16 weeks of therapy. Total and reverse total shoulder replacement patients typically begin therapy at 1 month post-op. This is a very individual answer. Pain medication is necessary to participate in the therapy that is important to your overall healing and improvement. We ask that patients take pain medication only if they have pain and to try to discontinue use of narcotic medications within 4-6 weeks after surgery. Federal laws now require handwritten prescriptions for narcotic medications. These cannot be refilled by phone. Do I have any life-long restrictions? Total shoulder replacements were initially developed for pain relief. Today’s joint replacement patients are active individuals who want to return to an active lifestyle. The quality of the materials have dramatically improved and extended the lifespan of the replaced joint. Do I have to do anything special when I go to the dentist? We recommend that after shoulder replacement, all patients should take preventative antibiotics prior to any dental procedure for the remainder of their life. Furthermore, we ask that patients refrain from routine dental appointments in the first 3 months following joint replacement to reduce the risk of infection. If shoulder replacement is in your future, attending to dental issues is best done prior to surgery. If you think you need shoulder surgery, call 713-766-0023 or visit www.wjbryanmd.com to schedule an appointment with Orthopedic Surgeon, Dr. William Bryan. He’s been in practice for over thirty-five years at the Texas Medical Center in Houston. About William J. Bryan M.D. Dr. Bryan has been in practice for over thirty five years at the Texas Medical Center in Houston. He earned a B.A. from Johns Hopkins University in Baltimore, Maryland before graduating with his M.D. from the Baylor College of Medicine in Houston, Texas.